Hoosier Trailers is an individually owned company, established in 2009. Our mission is to provide the best product at an affordable price, without the compromise of strength, durability, or quality. We are able to accomplish this by combining both a manufacturing AND living quarters facility under one roof, thus allowing a more consistent and efficient product line. At Hoosier Trailers, we strive to provide strong customer service and reliability for all of our customers. 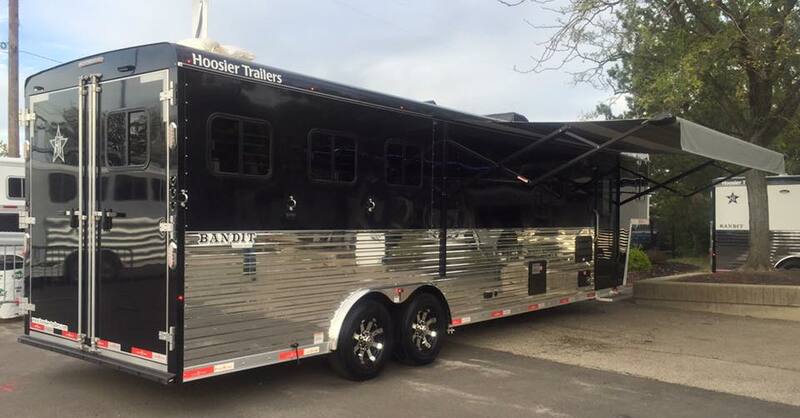 We provide a diverse line of horse trailers, from a two bumper pull to your “home away from home” living quarters dream. Couple that with our extended product line of Office Trailers and Sport Utility Trailers, and Hoosier is sure to have a model to fit your needs. Copyright © Hoosier Trailers 2016-17. All rights reserved, including digital rights. Production information and photography are as accurate as possible at the time of publication. Colors and finishes are photographic representations and may appear differently when viewing actual materials. Some features shown are optional. Features, prices, and specifications are subject to change without notice.